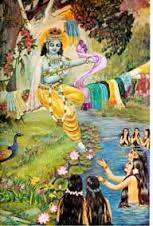 According to the Vaisnava almanac, the twelve months of the year are named according to the twelve Vaikuntha forms of Lord Krsna, and these forms are known as the predominating Deities for the twelve months. This calendar begins with the month of Margasirsa, which is equivalent to late November and early December. The Vaisnavas call this month Kesava. October–November Damodara. This Damodara is different from the Damodara in Vraja. The name Damodara was given to Krsna when He was bound with ropes by His mother, but the Damodara form who is the predominating Deity of the month of October–November is a different manifestation.